BLADENSBURG, Md. (CNS) — A national public interest law firm has filed a brief with the U.S. Supreme Court in “a last-ditch effort” to save a 40-foot-tall cross memorializing soldiers who died in World War I that sits at a busy intersection in the Washington suburb of Bladensburg. “The use of the cross reflected the custom in Europe during World War I,” the Thomas More Law Center of Ann Arbor, Michigan, said in a July 30 statement. It filed its brief with the U.S. Supreme Court July 27. In Europe “the cross became the principal grave marker in cemeteries where soldiers were buried, as described in … ‘In Flanders Fields,’ a famous poem of the time whose opening lines begin, ‘In Flanders fields the poppies blow, Between the crosses, row on row,'” the law center said. The Maryland-National Capital Park and Planning Commission acquired the memorial from the American Legion in 1961. It is located at Maryland Route 450 and U.S. Route 1. The state agency has spent about $117,000 to maintain and repair the memorial and has earmarked $100,000 for renovations. Hearing the appeal of that decision was a three-judge panel of the 4th Circuit made up of Chief Judge Roger L. Gregory and Judges Stephanie D. Thacker and James A. Wynn Jr. 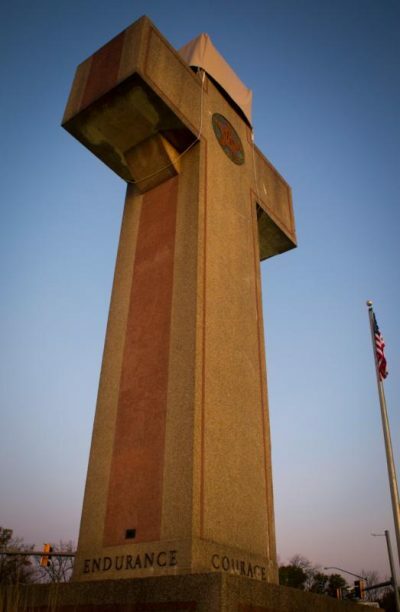 In his dissent, Gregory said the Peace Cross “has always served as a war memorial” and “has been adorned with secular elements for its entire history,” and sits near other memorials in Veterans Memorial Park. “(Its) predominant use has been for Memorial Day celebrations,” he wrote. The government is not required by the First Amendment to “purge from the public sphere any reference to religion,” he said.